It’s been on my to-do list for months and I finally did it. 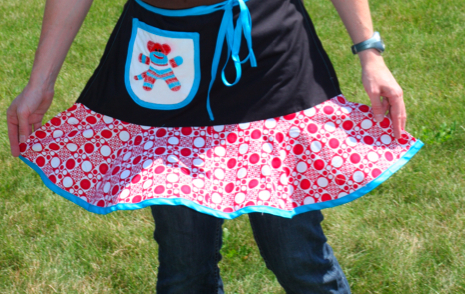 I made a sock monkey apron for Dulce, the sock monkey queen. 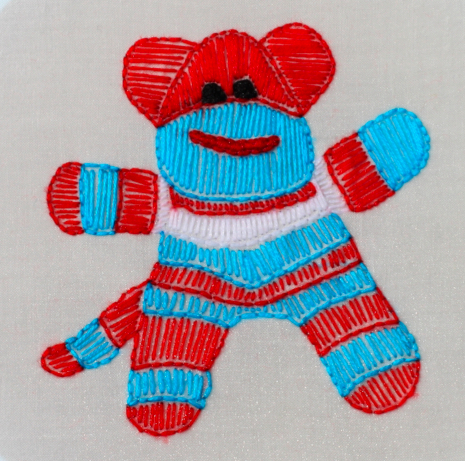 I made an embroidery pattern from one of the photos I took of her monkeys and embroidered like mad while watching the Olympics Saturday night. Everything was going swell until I sprayed the embroidery with water to erase the water soluble pen lines. To my horror, the red dye in the embroidery floss bled slightly onto the white fabric. I couldn’t believe it. I anticipated every potential disaster but that one. So, in the end, the monkey has a heavenly pink aura around it’s head. Thankfully, Dulce was gracious about accepting the smudged apron as payback for the darling monkeys she gave my children. She put the apron on right away and made me feel better about the craft mishap. My word. Thanks again, Dulce. The girls LOVE their sock monkeys. Do any of you know if colorfast embroidery floss is available on the market? Unless I can find a colorfast product, I might have to start washing my floss by hand ahead of time or something. Either way, I need to figure this out before my next project. I used to be very pleased to find this net-site.I needed to thanks for your time for this excellent learn!! I positively enjoying each little little bit of it and I have you bookmarked to check out new stuff you weblog post. I’m impressed, I ought to say. Seriously rarely do I encounter a blog that’s each educative and entertaining, and let me let you know, you have got hit the nail on the head. Your notion is outstanding; the concern is something that not enough people are speaking intelligently about. I’m incredibly pleased that I stumbled across this in my search for something relating to this.